The Bluffs Homes for Sale - Search The Bluffs homes for sale. 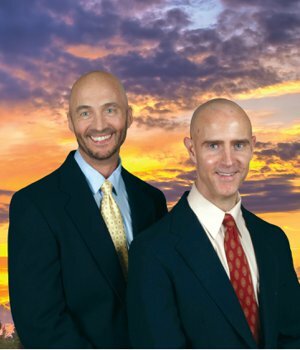 See all MLS Bluffs Jupiter FL Real Estate. Search all Bluffs Jupiter, FL homes for sale & photos. 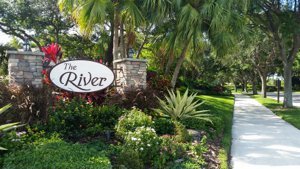 The Bluffs is a community made up of seven different residential areas near the coast, spanning from the Atlantic Ocean to the Intracoastal Waterways. The Bluffs are made up of The River, River North, The Ridge, The Marina, The Lakes, Ocean North, and Ocean South. This proximity to the beach gives residents of The Bluffs stunning views and a spectacular location. The Bluffs real estate consists of single-family homes and condos. Although the community’s homes were built in the mid-1980s by Burg & DiVosta, many have been recently updated with luxury amenities like granite countertops, marble finishes, gourmet kitchens, and stainless-steel appliances. Each community has its own separate recreational amenities, which include playgrounds, pools, dog parks, basketball and tennis courts, picnic areas, biking trails, and more. The Bluffs have much to offer for a fun, laidback lifestyle. call The Bluffs Experts, Thom and Rory. Residents of The Bluffs are also conveniently located near a wide variety of shopping, movie theaters, and restaurants. For instance, residents can go to the nearby beaches to swim, surf, boat, and fish. Another great place to fish is the Jupiter Inlet. Harbourside Place contains a new establishment called Jupiter’s Riverwalk. It has beautiful ocean views and access to great local restaurants and shops. To find the newest fashion trends, Downtown at the Gardens and The Gardens Mall offer plenty of options. There is always a way for the residents of The Bluffs community to be entertained. Residents of The Bluffs are served by the School District of Palm Beach County, which is highly regarded for its educational system. Great news for families: both public and private schools in the area regularly receive top marks. Two of the district’s high schools, William T. Dwyer High School and Jupiter Community School, are well-known for their academic success. The Bluffs River real estate consists of single-family homes with 3 bedrooms and 2 baths. The layout is spacious, offering lots of room for residents to customize the space to their personal tastes. Many homes have direct access to the coast or views of its breathtaking natural beauty. Real estate in River North consists of gorgeous townhomes with oversized living spaces. The Bluffs River homes offer plenty of recreational activities, including tennis and basketball courts, a pool, a picnic area, biking trails, and more. There is even a nearby dog park for pet owners or admirers: the Palm Beach County F.I.N.D. Park. Real estate for The Ridge at the Bluffs offer single-family homes that total 1,900 square feet of living space. Most homes have 3 bedrooms and 2 baths, and some have added a loft area for even more space. Some have extra privacy because the dunes are situated directly behind them. Recreation at The Ridge at the Bluffs community features tennis and basketball courts, a pool, a picnic area, and two playgrounds. 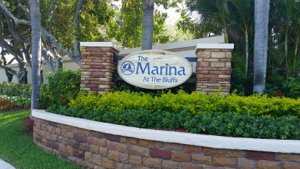 Real estate at The Bluffs Marina is made up of 22 buildings with 2-bedroom 2-bath condos that offer spectacular views of either the lake, the marina, or the Intracoastal Waterways. Many homes also feature private balconies that overlook the water, which are the perfect place to spend the beginning or end of the day. The Bluffs Marina are pet-friendly for animals under 20 lbs. Residents of The Bluffs Marina have plenty of recreational amenities in addition to their prime location near the coast. The community features 4 swimming pools and a marina to cool off from the Florida sun. To stay active, residents can play a game at the community’s tennis courts. Real estate at The Lakes at the Bluffs consists of 2-bedroom 2-full and 1 half bath townhomes that offer beautiful interior designs. 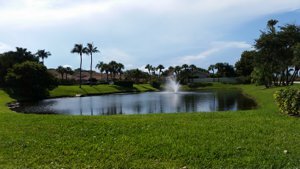 The community boasts its own lake and has vast courtyards for privacy. The windows offer views of either the lake or tropical gardens. Pets are allowed if they weigh under 20 lbs. The community’s recreational amenities include tennis and basketball courts, a pool, car wash area, and playgrounds. The Bluffs Ocean North and Ocean South is made up of 4 buildings with 2-bedroom 2-bath condos. Ocean South’s 7 buildings surround a central lake, and many rooms have gorgeous ocean views. Both communities feature a swimming pool and tennis courts to enjoy the sunny Florida weather. The homes in The Bluffs Ocean are not pet-friendly, but the nearby section of the beach allows dogs. 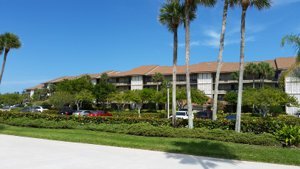 LEARN MORE ABOUT JUPITER AREA HERE. HOMES IN THE BLUFFS COMMUNITY WILL GO QUICKLY WHEN PRICED WELL. BE SURE TO GET ON OUR ADVANCED NOTICE LIST TO RECEIVE IMMEDIATE NOTICE OF THE LATEST LISTINGS PRIOR TO OR WHEN FIRST PRESENTED ON THE MARKET IN THE MLS. To get on The Bluffs waiting list Call: 561-741-9666 or Text: 772-349-8466. SEE ALL CURRENTLY ACTIVE HOMES IN THE BLUFFS BELOW. ASK ABOUT OUR SELLERS HOME MARKET REPORT FOR THE BLUFFS.